Every year on September 21st the world celebrates the International Day of Peace – a day devoted to strengthening the ideals of peace, both within and among all nations and peoples. This annual celebration provides us with an excellent opportunity to have conversations with our scholars about what peace is, what it means to them, and most importantly how to achieve it. As we welcomed our scholars back for this school year we took time during the their first week with us to have these conversations and let them express their thoughts and reactions through art. Inspired by the Pinwheels for Peace project, scholars at Middle School 1, designed colorful pinwheels to be displayed on the International Day of Peace. The hope of the Pinwheels for Peace project is to inspire visual statements of peace, unity, and tolerance around the world. With the Olympics just wrapping up, many of our scholars took inspiration from the world recently coming together around the spirit of good sportsmanship and peace. 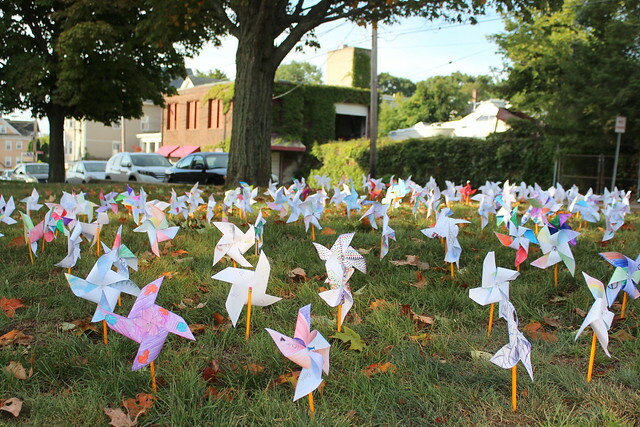 Others designed pinwheels inspired by the community and cooperation they know from Blackstone Valley Prep. The result was a beautiful installation showcasing the hope today’s youth has for the future of the world and the impact they would like to have.